Seattle is home to some pretty great craft beer bottle shops. Whether you’re in the heart of the city, in the North end, on the East side or down South, you can still find a craft bottle shop without having to search too far and most of them, though not quite all, have taps as well. Let me tell you, nothing compares to shopping for craft beer while sipping on a craft beer. One of my favorite craft bottle shops, and the one I probably hit up most often, is The Beer Junction in West Seattle. With over 45 taps (and even more coming soon) and well over 1,300+ bottles from over 50 countries, you’d be hard-pressed to not find something you’ll love either on tap or in the bottle. The Beer Junction is also known for their events. The have a tap takeover, a meet the brewer or a tasting event nearly every week as well as a few larger events throughout the year. One of those larger events, Barrel Junction, kicks off tomorrow, January 24th and continues through next Sunday, February 1st. During this time, at least 25 of The Beer Junction’s taps will be dedicated to barrel-aged beers, including a very special tapping each day at 5 PM. 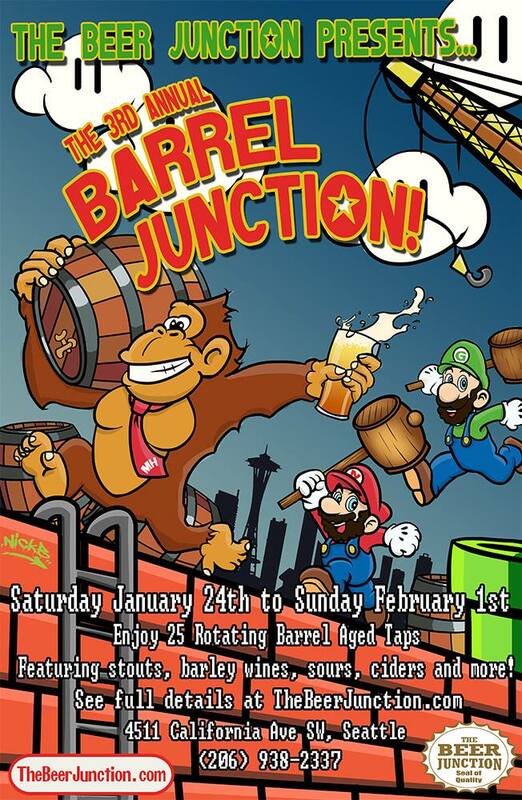 (Seattle, WA) The Beer Junction, a West Seattle bottle shop and beer bar, is excited to kick off the start of our 3rd annual barrel-aged beer fest! “Barrel Junction” is a nine-day celebration of barrel-aged beers and ciders, featuring some of the best and rarest aged stouts, barleywines, sours, ciders, and more. From Saturday, January 24th to Sunday, February 1st, we will dedicate at least 25 of our taps to barrelaged brews. In addition, each day at 5PM we’ll be tapping a headlining keg, and we also have six different brewery events over the nine-day festival. The styles of beers being tapped are far ranging, but they all have one thing in common—at some point they have been aged in either an old spirit or wine barrel or on fresh wood. Barrel aging can add a wonderful layer of flavor, complexity, and aroma. Many of the beers to be tapped have been patiently waiting in our cellar for one to three years. See the opening lineup and event schedule below. Taps will rotate often throughout the fest, so be sure to check out our live tap list at TheBeerJunction.com. Many of the beers we will have on tap are higher in alcohol (many are 10% ABV or more), so sampler trays of 4oz pours are encouraged to try the great variety available. The Lost Abbey/ Port Brewing with Co-founder and Director of Brewery Operations Tomme Arthur! version of their Bonfire Winter Ale, Coffee version of their Abominable Winter Ale. Join us for the game as we tap one of our rarest offerings of the festival, a 2011 Vintage of The Lost Abbey’s Deliverance Ale at 3:30PM. 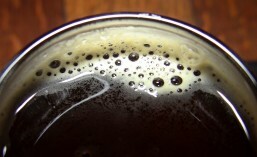 In addition, during the game we will be offering $4 pints of Boneyard RPM IPA. Founded in 2010, The Beer Junction is a family-owned and operated specialty bottle shop and beer bar located in the historic Junction District of West Seattle. With 1500 different bottles and 40+ rotating taps, we offer one of the largest collections of craft beer and cider in Washington. Follow The Beer Junction on Facebook, Twitter (@thebeerjunction), or visit www.TheBeerJunction.com for more information or to see our live tap list. That’s a lot of information. So take your time looking over the opening lineup, the special 5 PM tappings and the brewery events, and decide which day(s) you’ll have to come down to The Beer Junction to get the beers you’re after. For a more concise version of everything that’s happening during this muli-day event, you can download the full Barrel Junction 2015 Calendar Of Events HERE. I’m still trying to decide which day(s) I’ll attend, but I will probably at least be there for the kickoff tomorrow. I hope to see you there. This entry was posted in Beer, Best Of, Bottle Shops, Bourbon Barrel, Events, Festivals, Rare, Seattle, Tasting, Washington, Washington Beer, West Seattle, Wood Aged and tagged 2015, beer, events, February, festivals, January, The Beer Junction. Bookmark the permalink.